The SNMP-enabled AKCP water sensor was developed specifically for the reliable detection of water and moisture. Critical infrastructures such as server room, computer center, production and storage may be destroyed by storms, broken water pipe, heating and air conditioning failures, etc. within minutes. Rising energy prices has come into fashion, water-cooled server racks also have a not to be underestimated loss potential! Not every company / any contracting authority has a mirrored server space, so that in addition to massive economic damage, think of costly downtime, and legal consequences can be the result of flooding in the server room or data center. The precise measurement unit of AKCP water sensor based on advanced microprocessor technology and enables a reliable early indication of leaking water / moisture. By measuring the conductivity of water, this sensor can also detect distilled / demineralized water reliably. For example, the discharge of condensation from an air conditioner or battery water can be reliably detected. The water sensor is an OID (Object Identifier) ​​and supports a direct SNMP query. The SNMP-enabled water sensor is equipped with an RJ-45 connector and is connected to a free sensor connection of the AKCP sensorProbe or securityProbe alarm server. Using the Auto Sense technology, the sensor is automatically identified by the alarm server. You must define only the web interface of the AKCP sensorProbe or securityProbe whether when water leakage via email, SMS or SNMP trap to your network monitoring system (OpenNMS, Monet, Nagios, IBM Tivoli, WhatsUp Gold, HP OpenView pp want to be notified.). Per Disconnect alarm will notify you if the water contact sensor as a result of manipulation or tampering was interrupted. Important note: A montage of the water sensor on metal surfaces (steel decks, etc.) not allowed. 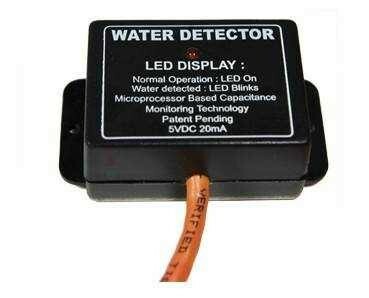 Related links to "Water Sensor"
Customer evaluation for "Water Sensor"